is that where are Direct TV connection be from even though we travel all over? I'm new at this too. I have alot of questions and lack the knowledge. Thanks. PS I have built and use the dish stand found in Bill & Barbs site it works like a charm its easy to set up isn't effected by wind and is a great conversation starter, another thing that is a good deal is a Sat. signal finder, these are available on e-bay for about $20.00. Here's another one. .75 meter (30 inch) Winegard dish ... so far has survived 40 MPH. Thanks, Gary B. Has anyone used the satellite for internet service? We just signed up for DirecTV internet service and TV for our house and when we go fulltiming. Any information on how successful the connection is on the road. Yes you can use DiecTv satellite internet service anywhere you travel. I suggest an ISP provider who does mobile systems. You must register on the correct satellite to have acces where you travel, each has it's own footprint. You also need the large dish, not the small one you use for TV. Do they allow the consumer to align their own dish now for the internet service? Or do we still need the spendy MotoStat type systems? You still need the spendy MotoSat type which must be installed by a certified installer. How long does it take for you to set up your internet dish at each campground? This one at our house, the first time, took an hour. The tech guy says, "practice makes perfect." Our motorhome has the satellite dish mounted on the roof. It has a digital read out in the compartment above the drivers seat. You turn on the television, go throught the set up proceedure for Direct TV or Dish and it tells you what your elevation and azmuith is supposed to be. I don't think I spelled (azmuith) right but it is the direction you point the satellite. I bought a device that hooks into the cable line between the satellite and the receiver and when I turn the dish it shows me when I am getting the strongest signal. They sell them at Camping World. I have only had a couple problems with trees. You have to know the zip code of the campground to find the correct directions to locate the signal. 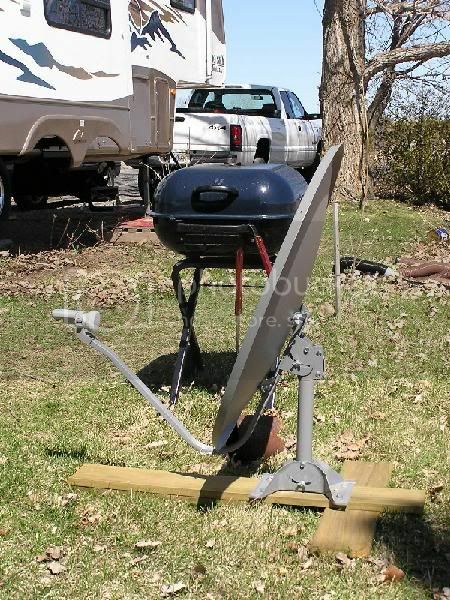 When I had my travel trailer I bought a tripod at Radio Shack, about $25.00 and mounted the dish to the top of a short length of steel fence post. It was just the right size. Then I fixed the tripod with thumb screws so that it would fold up into a easy to carry package. The legs of the tripod had holes in them to mount to a roof, etc. But I used steel tent stakes to anchor it to the ground. I would then turn on the television and go through the procedure to locate the signal. It looked nice and put the dish a few feet off the ground. I agree that you should probably consider buying a seperate receiver. They will charge you about $6.00 a month to operate it. When you aren't camping you can call Direct TV and have them suspend the service. Then when you get ready to go again you just call them and they will re-program it to receive. The only thing I don't like is the restrictions on local channels. Lot of times you can't get them. The one at your house probably had duel receptors. So they had to be programmed separately. That means you have more than one receiver because they handle up to four. The dish you use on a trailer or motorhome only has one receptor for the signal. It is a lot easier to program in. Once you figure it out you will realize just how simple. Read all of the instructions and then follow the directions on the television screen for putting in the zip code where you are camping and finding the strongest signal as you move the dish. OH! And you will have to have a good compass to locate the southern direction for the signal and the digital locator described in previous post will help you find the signal once you are pointed toward Texas. If you use the pricey MotoSat, lock in time when you stop is a minute or two. The first setup, done by your insaller, takes some time but then the internal GPS keeps track of where you have gone, where you are and where to look. It is all automatic as long as you never loose DC power to the system. Even then you can resore in 10 minutes or so. I am going to be a full timer very soon and am a bit confused about the legalities and logistics of satelite tv and internet. Is it correct to say that you can take your home satelite tv on the road with you but it is illegal to do so for satelite internet? Does satelite internet not work away from home? I am a boondocker with not alot of money and I need daily internet access for my traveling business. Any suggestions? Thanks. It is legal to take your television satellite with you; you pay a monthly fee for each activated receiver an it matters not where it is located. Of course local channels do not work when you move out of that region and you should sign up for N.Y. and L.A networks. Internet is different, as you need to be certified to install or set up an antenna. You need to set it up at every location, thus the legal issue. If you have an automatic system installed by a professional you can connect every place you stop with no issues. These are pricey systems but a workable and legal solution. MotoSAT is the most common with IP through ground control out of Salt Lake City. My satellite question is if I take one of my receivers from home, can I still get satellite service at home as well as wherever I happen to be on the road? My son will not be joining us on our next trip and would like to have the service available at home while we use it on the road. Welcome to the forum....I would think y our son would still be able to watch Sat tv from home. Just because you have disconnected one of the receivers doesn't mean the entire network shuts down. Why would he need another receiver? What's the logic for that. Just trying to understand. If he had 4 tv s hooked up at home and just disconnected one receiver....why wouldn't the other three work?